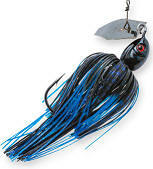 No lure in recent memory has had such a profound impact on freshwater fishing as The Original ChatterBait. With its patent-pending design and unique hex-shaped ChatterBlade®, the sound, vibration, flash, and action of The Original ChatterBait is unmatched. 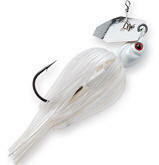 The Original ChatterBait is designed to "swim" in an erratic motion that mimics wounded prey. 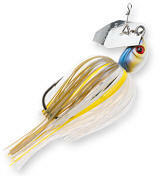 It offers the action of a crankbait, the profile of a jig, and the flash of a spinnerbait. 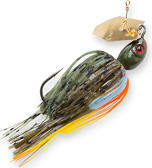 The Original ChatterBait is a great choice to fish heavy cover. The hex-blade serves double-duty as a weed-guard to keep the hook from snagging on weeds or brush. Won't hydroplane on a fast retrieve. Regulate depth by working it slowly, at a moderate rate, or crank the reel handle as fast as you can. The Original ChatterBait responds with the appropriate action to track straight and stir fish into striking. Select from a range of EZ Skirt® and ElaZtech® split-tail trailer colors. Available in 1/4oz, 3/8oz, 1/2oz, and 5/8oz weights. Actual size is 4 1/2"
Project Z ChatterBait Fueled by the wants, needs, and recommendations of avid anglers the world over, the Project Z ChatterBait is Z-Man's top-of-the-line bladed swim jig, taking the proven versatility and fish-catching performance of The Original ChatterBait to an entirely new level! This new entry in the ChatterBait line features a streamlined head design that allows the blade to swing more freely, resulting in more vibration, whether you're ripping the bait through grass or employing a more mthodical stop-and-go retreieve, as well as upgraded components for increased longevity.